Look no further for a Halloween centerpiece than the fun 3-D Jack-O-Lantern Centerpiece. The 3-D Jack-O-Lantern Centerpiece is friendly Halloween decoration that will be enjoyed by everyone. Once you open the package you will have (2) pieces with slits. One slit is larger on one of the pieces than the other. You take the one piece with the longer slit, and slide it into the short slit on the second piece. 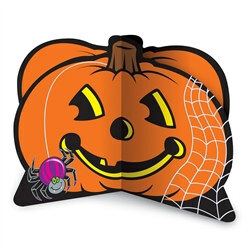 Each side of jack-o-lantern includes one of the following a black cat, candy, candy corn, bats, ghost, frog, spider, and a spider web. When your not using the two come apart and lay flat for storing. Another fun Halloween centerpiece is the 3-D Candelabra Centerpiece.